Three Types of Nerve Damage Caused by a Dog Bite | Hupy and Abraham, S.C.
A dog bite is a traumatic experience that can cause the victim to sustain serious injuries with long-term complications. A dog bite is not as uncommon as you may believe. In fact, there are nearly five million individuals who are bitten by dogs each year. Over 350,000 of these victims require the attention of a medical professional. 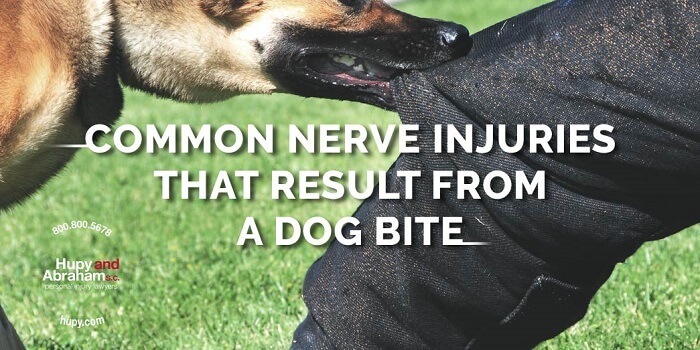 One of the common injuries that a dog bite victim may suffer from is nerve damage. Nerve damage is common due to the combination of a dog’s strong jaws and sharp, long teeth that can penetrate deep into the victim. There are three different forms of nerve damage that a dog bite victim may suffer, and each of these forms will be discussed below. Neurapraxia occurs when a nerve gets stretched, and damage is done to the myelin sheath surrounding the nerve. The myelin sheath is not part of the nerve, but it insulates the nerve and allows electrical signals to move along the nerves. Symptoms of neurapraxia include numbness, stinging or burning. In many cases, the myelin sheath will heal without invasive medical treatment. Your doctor may prescribe rest, icing, elevation of the affected area, range of motion exercises, or physical therapy if you are in pain or if your symptoms linger. While neurapraxia can be painful and it may result in a loss of function for up to a few months, it is a mild form of nerve injury and a full recovery is often expected. Different layers of cells and tissue make up a nerve bundle. If you suffer axonotmesis, then the myelin sheath and the axons surrounding the nerve have been hurt. This often occurs when the nerve is stretched. Since the axons are involved, axonotmesis is typically a more significant nerve injury than neurapraxia. Axonotmesis can immediately result in sensory issues, loss of motor function, or paralysis. You may experience weakness or pain. As long as the nerve is not severed, many people can make a full recovery from axonotmesis. The recovery process begins at the proximal end of the nerve and moves toward the distal part of the nerve. You may experience strange sensations or involuntary movements during this period of nerve regeneration. Overall, your recovery may take several months or years. Neurotmesis is the most severe form of nerve damage that a dog bite victim may experience. It occurs when the axons and sheath are completely severed. Symptoms of neurotmesis include pain, uncomfortable sensations, loss of motor function, and loss of sensory function. If you experience the symptoms following a dog bite, then your doctor will perform an examination and clinical tests. Often, your doctor may need to wait to see if nerve regeneration occurs before confirming a neurotmesis diagnosis. Unlike other forms of nerve damage, neurotmesis will not spontaneously heal, and a full recovery does not usually occur. Instead, surgery will be required. Surgery can reverse some of the effects of neurotmesis, but it may not undo all of the effects of neurotmesis. Prior to surgery, your doctor may give you pain medication and may recommend splinting the affected body part to prevent further damage. Whether you suffer neurapraxia, axonotmesis, or neurotmesis, you may incur significant medical bills, and you may lose time from work and your daily activities. Additionally, you may experience pain and suffering. As a dog bite victim, it is important that you seek compensation for your injuries. You have the right to recover damages if someone else’s dog caused you to suffer nerve damage or any other type of dog bite injury. However, in order to make a fair recovery, you are going to have to take action. You are going to have to negotiate a fair settlement or go to trial, but you don’t have to do these things alone. Instead, you have the right to call an experienced dog bite attorney. Contact us online to schedule a free legal consultation, or call us directly at 1-800-800-5678 to learn more.